Lot Detail - Eric Lindros' 1992-93 Philadelphia Flyers Game-Worn Rookie Season Jersey with His Signed LOA - Centennial Patch! - 41-Goal Season! Eric Lindros' 1992-93 Philadelphia Flyers Game-Worn Rookie Season Jersey with His Signed LOA - Centennial Patch! - 41-Goal Season! 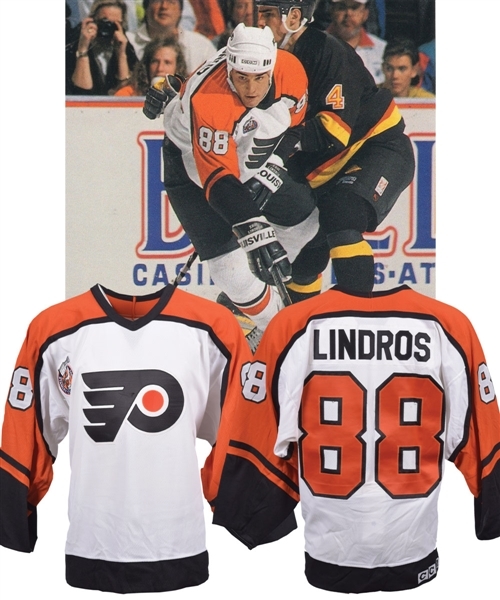 Well remembered for his selection as the first overall pick by the Quebec Nordiques and the subsequent trade to the Flyers that followed, Eric Lindros first donned the famous winged-P of Philadelphia in 1992-93, securing 75 points in 61 games on his way to becoming the 4th fastest player in NHL history to register 300 points. We have a highly desirable Flyers jersey that was worn by the 2016 HOF inductee during his rookie campaign, in 1992-93. A rolled Maska Air-Knit label with handwritten “88” sits affixed to the collar along with a size “56” fly tag, with embroidered NHL and CCM crests over the reverse bottom hem. Styled with the highly recognizable Flyers team crest, the mesh-style V-neck has been accented with oversized tackle twill sleeve and verso numbers, with the Stanley Cup centennial crest over the right breast. The garment also sports customized shortened sleeve cuffs, with both Eric and the Flyers’ team trainer signing the reverse of the team crest in black marker. A signed LOA from Eric Lindros will accompany. Marks are visible over the lower front, with faint board burns over the right sleeve. There is also a minor fabric pull near the Stanley Cup centennial crest.